The cry for criminal charges to be slapped on the bigwigs at Wells Fargo continues to grow louder. Senators Bernie Sanders, Elizabeth Warren and their colleagues urged Attorney General Loretta Lynch in a new letter to "thoroughly investigate the culpability of senior executives" at Wells Fargo (WFC) in the fake account scandal that shocked America. As CNN previously reported, the Department of Justice has already launched a criminal investigation into Wells Fargo. The 14 U.S. Senators warned Lynch on Monday, that Wells Fargo is a "critical test" of the DOJ's recent push to pursue bad behavior of individual executives, rather than just impose fines on the corporations they represent. The lawmaker said they hope the DOJ "brings all the resources it has to bear" on investigating possible wrongdoing by "senior executives"
After the 2008 financial meltdown, "the American people watched as senior executives repeatedly escaped accountability" as no top Wall Street executives "went to prison or even faced prosecution," the letter said. Wells Fargo didn't immediately respond to a request for comment. It's the latest example of high-profile lawmakers applying pressure on law enforcement to pursue charges against the top brass of Wells Fargo after the bank admitted to firing 5,300 employees over the creation of as many as 2 million unauthorized accounts. Sanders previously sent a letter to regulators asking whether criminal investigations were going on. "Wall Street won't change until we make it clear that no bank is too big to fail and no CEO is too big to jail," Sanders wrote. On Twitter, Sanders noted that "zero" people at Wells Fargo "are going to jail," yet "if you smoke marijuana in this country, you get a criminal record." How many people at Wells Fargo are going to jail? Zero. But if you smoke marijuana in this country, you get a criminal record. At last month's Senate hearing, Warren loudly slammed Wells Fargo CEO John Stumpf for "gutless leadership" and demanded he step down and face criminal investigation from the DOJ and SEC. The Senators specifically mention Stumpf as a potential target for criminal charges. The letter notes that Stumpf testified under oath that he became aware of employees creating fraudulent bank accounts in 2013. 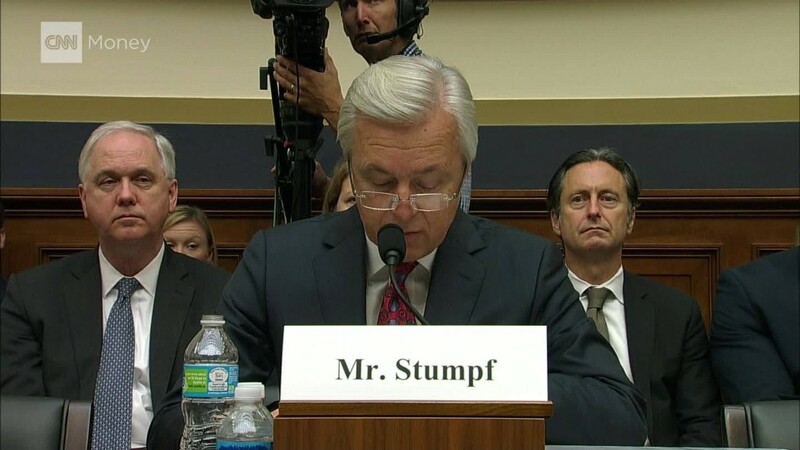 However, Stumpf did not disclose the issue to investors and continued to pitch Wells Fargo's "inflated" retail accounts numbers to Wall Street, the letter said. "These facts raise questions about whether senior executives, including Mr. Stumpf, knowingly allowed illegal conduct to continue," the letter said. Besides Warren and Sanders, the letter was signed by other U.S. Senators such as Al Franken, Richard Durbin, Patrick Leahy and Kirsten Gillibrand. All 14 signatures were from Democrats except for Angus King, the independent from Maine.